I have come across a little tip that I thought I would share. 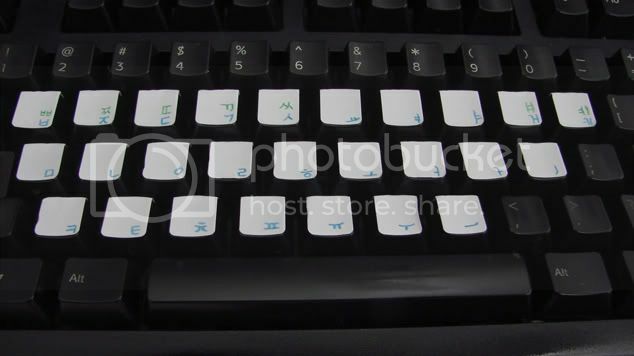 I am used to typing on a standard English-language keyboard with little transparent Hangul stickers affixed to the keys (less than 5 bucks on ebay). Recently, my computer was out of commission so I had to use my roommate's laptop (no Hangul on keyboard). Thankfully, Vista makes it seriously easy to install a new input language. But, I didn't have any physical map of the Korean keyboard layout. So, when I would type, I was pretty much guessing at first - hoping I would get the right letter. As foolish as this sounds - it has really helped me out a lot! When I first started learning Korean, typing was pretty much as fun as rugburn - I would even try to copy and paste from other sources instead of just typing it myself. Sure it took longer to copy and paste but it was a confidence issue, clearly, and I was not confident typing in Korean. It won't be helpful to all, but for anyone who was in my position, it's gold. Last edited by matthew254 on January 8th, 2009 10:25 am, edited 1 time in total. This is how I learned to type in Korean. Although I hated it with a passion, and cut-and-pasted just as you did, I am amazed at how well I know the keyboard layout now (just about four months into my Korean study). I don't even run all over the house anymore looking for my Korean keyboard printout to put next to the computer. There are a couple of letters (sounds? symbols?) I still have to hunt n' peck, but it doesn't frustrate me anymore to do so. Nothing short of miraculous! Now I'm having to learn to type in Arabic, which is somewhat more complex. It might even be too complex to learn with this method (gosh, I hope not). I have known the alphabet already for a long time, but I still tremble in fear at the thought of typing in Arabic. That just goes to show how simple the Korean writing system is. So, no excuses, newbies! I ordered a Korean keyboard today. Sure it's possible to do just fine without one. The last time I tried to start learning Korean I wrote the characters on my keyboard using some kind of permanent marker (which ended up being not so permanent) and I printed out a little paper with the layout that I taped to the monitor. But this time I thought I'd just avoid going through that trouble again and get a real Korean keyboard. Since Korean keyboards are based on the standard US keyboard the benefit is double as finding a US keyboard is almost impossible here. The teacher always said to type without looking at the keyboard when they were teaching typing in school. It makes sense that the same applies to typing in any language. I started using a computer before I ever saw one in school, so I still have pretty bad ingrained typing habits. When I learned the Korean keyboard layout, though, I never bothered to put stickers on my keyboard or print a layout, so I just learned it by touch. I even leave my fingers on the home row, and I never do that when I type in English. I was using an ibook and really really love the romanisation input method. e.g. han gug eo. Then I could type korean as fast as english! Eversince my ibook harddisk crashed, I have to use a windows notebook with hangeul ime but without hangeul keyboard. Even after some practice i'm still very slow in typing korean. I still need to look at the keyboard and it takes me like 1-2 sec at least for each key. argh... really painful. Does anyone know if there's any korean ime out there with romanisation method for windows system? i never tried the romanization system. And as far as I know Windows only has the Hangul keyboard. Does anyone know if there's a MAC specific input program or method? vmipiper wrote: Does anyone know if there's a MAC specific input program or method? Yes.. it is incredibly easy. Go to the System Preferences and click "International" Click on "Input Menu" scroll down the list and under "Hanguel" add "2-set Korean"
At the bottom of the window click the box that says "Show Input menu in menu bar"
You will see a little flag at the top right of your screen. if you click it, you can easily change from English to whatever other language you want to use....clicking on Show Keyboard view will bring up a map of the Korean keyboard as well. Does anyone know how to make the nice Flash Player dispay the Korean characters at http://www.kidtaja.co.kr/ (in the typing field)? I just get gibberish. what helped me the most was using skype to talk to people who didn't speak english.. when you HAVE to type in korean and you HAVE to type fast to keep up with the conversation, that helps. also, don't be afraid to hit the wrong keys. i still do it all the time. even with english, haha. you can always delete. I just wanted to agree with most people that the best way to learn is not to buy the little stickers. In the beginning just hunt and peck your way around by trial and error. It is really frustrating, but I think the frustration is actually motivating your brain to memorize the key positions. It really didn't take me long to learn at all. Haha, I just bought, like, white labels at the store last night, and manually labeled my keyboard myself. I'm just learning Hangul now (for a few days). And, I'm sure the memorization would be a lot faster without the visual keys. But even learning the english keyboard, the keys were there in case you got lost, which I support putting hangul stickers (or a chart close). You can take them off when you're better. I've been typing since I was, maybe 10, or 11 (I'm eighteen now), and sometimes I'll blank out and forget a letter and have to glance at the keyboard (not very good with the numbers still, never had much use to use the top number rows). But, I think I can thank repetition for typing so efficiently, and I'm sure it'll soon be the same with typing with the hangul IME. Though, I mainly, I did get the stickers (white labels, and wrote the characters myself) to cover up the english lettering. Because I'd confuse the english letters with the romanized hangul (like, if I wanted ㅋ, I'd look for the K key, and not the Z key like it's assigned to). I've already memorized the english keyboard(due to repetition) so it's fine covering up the letters. But the actual hangul characters on the keys are much easier than looking at a chart on the side or something. I'm sure I'll take them off sooner or later. Uhm. So .. Question! I can sort of romanize hangul characters as I'm learning, but isn't it kind of a setback that I don't know korean to begin with? I mean children are first taught to speak before writing. Shouldn't it be the same when you learn another language? Maybe I'm going about this the wrong way? Regardless, I'll try to memorize the hangul characters (still haven't memorized the complete alphabet/characters). Because, being in America, I guess it makes sense that you'd need to learn how to read Hangul first because how else are you going to read korean? Rarely do korean websites publish romanized characters.